It’s time to start planning your itinerary for the PSA Trek July 10 – 17, $515 per person. Whatever itinerary you come up with, you need to know the basics of itinerary planning at Philmont. Here they are. Philmont requires that the first three nights at Philmont be slept under 9,000 feet elevation. You can hike as high as you want on any day. The reason for this rule is altitude sickness prevention. Your itinerary must comply with this requirement. The night before reporting to the Welcome Center, July 9, must be spent in the Philmont area and that counts as the first night. The night of July 10, spent in Camper Tent City, counts as the second night. In order to be compliant with the rule, the first night on the trail must be spent at an official Philmont starting camp, including Minette Meadows on the Cimarroncita tract, or one of the following staffed camps: Zastrow, Carson Meadows, Abreu, Urraca, Crater Lake, Miner’s Park, Clark’s Fork, Cito, Hunting Lodge, Harlan, Indian Writings, Ponil, Pueblano or Dean Cow. Trekkers providing their own transportation to the Valle can spend the first night at Ring Place or Whiteman Vega. No exceptions, even if a camp is below 9,000 feet. Note that if you spend the first night at Minette Meadows on the Cimarroncita tract, your gateway to the rest of Philmont is via Ute Park Pass. Hikes on successive days should generally be in conformity with hikes found in approved Philmont itineraries. Itineraries with hikes substantially exceeding the length of those found in approved Philmont itineraries may be subject to disapproval by Logistics. Even though your itinerary may comply with 9,000-foot rule and be in conformity with hikes found in the approved itineraries, your itinerary should be appropriate for the hiking abilities of your crew. Not everyone can do a super-strenuous itinerary. Harlan to Deer Lake – new trail construction, meet at ??? With all these opportunities, meeting the conservation requirements in 2016 should be easy. Your itinerary planning must take into account the established bus drop-off/pick-up points. These points are Cimarroncita (replacing Bear Canyon) 6 Mile Gate, 9 Mile Gate (Ponil Road), Chase Ranch, Cito, Lover’s Leap, Ponil, Rayado (Kit Carson Museum), Turkey Creek and Zastrow. In addition to the above, personal vehicles may be used to get you to and from the “parking lot” south of Whiteman Vega Camp in the Valle Vidal on Cerrososo Road east of McCrystal campground. Personal vehicles are not permitted at the Maxwell turnaround, and there is no bus service, either. Your itinerary should provide for food pick-ups. You can pick up food at Ring Place, Rich Cabins, Baldy Town, Ponil, Ute Gulch, Phillips Junction, Miner’s Park and Apache Springs. Your itinerary planning should include consideration of drop-off and pick-up points, hiking abilities of crew members, food pick-up, and compliance with the 9,000-foot rule. The rest is up to you. Get your Philmont maps out, start planning itineraries, share those itineraries with friends, and join in the fun of planning! Your Trek experience starts now. Photo courtesy of Michael R Perry. Philmont requires that all crews have at least two participants, (adult or youth) in each crew who are currently certified in Wilderness First Aid or the equivalent and CPR from the American Heart Association, the American Red Cross or the equivalent. Getting certified in Wilderness First Aid can be a challenge—it is sometimes hard to find an available course. Visit your council service center for more information about when your council will be offering Wilderness First Aid instruction. Do this soon because some councils do it early in the year and these classes fill quickly. If your council does not offer this instruction, call your local Red Cross to see if the course is being offered. For years you have requested an opportunity to get out to the Philmont backcountry, get dirty, and give back to Philmont in a lasting, meaningful way. Your request has been granted. Your Philmont Staff Association and Philmont Scout Ranch are excited to announce the PSA Volunteer Vacation. This is your long awaited opportunity to get out, get dirty, give back and have a lot of fun. The PSA Volunteer Vacation will be an annual event of your PSA, and in 2016, will be limited to twenty lucky persons. 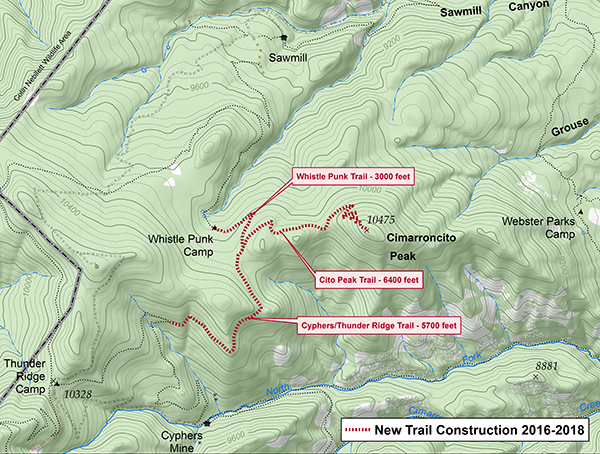 In the first year, we will be building a new spur trail off the Sawmill and Thunder Ridge trail connecting the brand new Whistle Punk trail camp to the top of Cito Peak – where no trail has gone before. Eventually this trail will go to Cypher’s Mine, providing a route through a seldom used part of Philmont. When the first campers summit Cito Peak, and when they later go on to Cypher’s Mine, you will have the honor of having helped to make this happen. In recognition of your efforts, you will receive a distinctive official Philmont issued award patch. Take a look at the High Country cover to see your reward. This will be one of the most difficult to acquire official Philmont issued patches. The dates are September 17 to 24, 2016. The cost is $210. This includes a $25 non-refundable cancellation fee. (If you cancel, you get back $185). The full Philmont medical form will be required – the same 7 page form required for Trekkers. Just because your doctor certifies you that does not mean this program is for you. This program involves hard work, long hours, a good crew spirit, backpacking ability and a sense of humor. This program is not going to be leisurely and is not for those who are afraid of sore muscles, getting dirty, and who cannot laugh when the going gets tough. The PSA reserves the right to return the entire registration fee of any person who would be inappropriate for this program. This program is available to PSA members and their eligible family members. The minimum age is 16 years by date of participation. Trek-eligible family members include your spouse, child or stepchild, sibling, parent, grandparent, grandchild, niece, nephew or in-law of PSA member who meets the eligibility requirements above. Please do not register anyone who does not meet these requirements. …you will arrive at Philmont after lunch. You will meet in the dining hall at 5 PM have dinner, and then do a shakedown. …you will have breakfast in Base Camp and then depart for your drop-off point, Sawmill. You will then hike to Whistle Punk trail camp, set up camp, and have lunch. Following lunch, you will receive Philmont tools and trail construction instruction, start trail construction work, and have fun. …more trail construction work and fun. …even more trail construction work and fun. …relief at last! You will tidy-up uncompleted trail construction work and clean-up the campsite, and then hike to another campsite of the crew’s choosing and spend the night. …in the morning you will hike to the pick-up point and return to Base Camp. You will then have the option of climbing the Tooth of Time, and on Friday evening, you will enjoy a steak dinner and be recognized for what you have given back to Philmont. …depart Philmont, and when looking up towards Cito Peak, let your eyes mist over, and know that by your efforts, Cito Peak will soon be accessible to future generations of campers. We will eat trail food supplemented by bulk food to insure sufficient calories. This will be a better menu than the standard trail food menu. The food will be prepared using the crew method. No. You will carry a lighter pack. Philmont will pre-stage food, tools and crew equipment at Whistle Punk. The extra room in your pack can be filled with work clothes and warm clothes. Probably. Whistle Punk is at 9,900 feet, and by the time of this event, autumn will be setting in. You will need warm clothes and a warm sleeping bag. Whistle Punk is located south, and uphill, of the trail from Sawmill to Thunder Ridge. There is a newly discovered spring at Whistle Punk. This camp will be first used in 2016. We will put you on a wait list. * The twenty slots will be filled in the order that registrations are received. The preferred method of registration is electronic by using the “Register Now..” button near the top of this page. The slots will be filled according to the date and time an electronic registration is received or, if registering by mail, the date and time of receipt by the PSA office, or if you call in your credit card information, the date and time of that call. Postmarks earlier than March 1, 2016, or dial-in registrations prior to noon Central Time on March 1, 2016, will not be accepted.